Oh no! Not another book predicting the future that never gets beyond some of the worst features of today, including the all-pervading sense of hopelessness. In fact, far from it. The book reflects the rapidly changing world. Understanding how we got here is critical, but thinking about what will happen next is the real challenge. Peter Frase, in his book Four Futures (2016), attempts to do just that. He reflects on the social impact of increased mechanisation of the workplace, converging with an intensifying ecological crisis, within the overarching context of the capitalist crisis. Building on German-Polish Marxist, Rosa Luxembourg’s powerful slogan that can be summed up as “socialism or barbarism”, the author paints a picture of four possible futures. 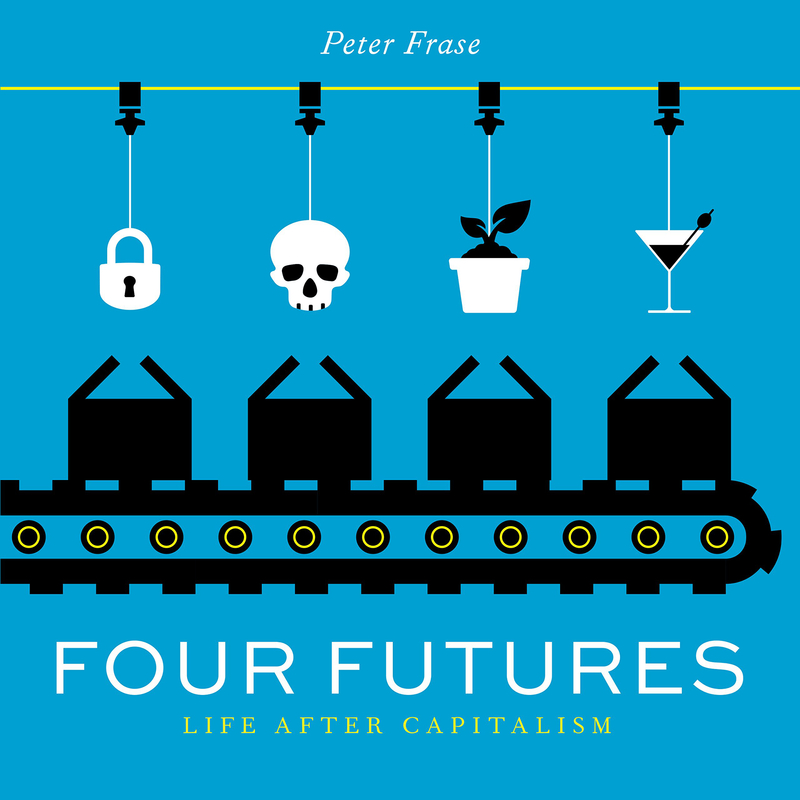 Frase offers something different from other writers who postulate that the increased mechanisation of the workplace will bring about a techno-utopia (that is to say that advances in technology will automatically bring about improvements in the standard of living). This is because he argues that the future is uncertain and contingent. So what happens next is neither inevitable nor predetermined. Instead the future is wholly dependent on the actions of human beings. The only thing the book predicts for certain is the end of capitalism, as we know it. This makes Four Futures different from other books on the future, because it does not attempt to predict the future. Instead it endeavours to tell a captivating story, which includes tales of power, scarcity and abundance. The constant throughout all four worlds is rapid improvements in technological innovation. In reflecting on the social impact of this (will it culminate in us moving towards utopia or dystopia?) there are common questions that thread through the four possible futures in the book. What is work, and what will it look like? What will ownership look like? What kind of societies could emerge as a result of changes in the thinking behind these ideas? In these societies, the big question for Frase would be: who pays the costs of ecological damage and who enjoys the benefits of an even further enhanced automated society? For him, the winners and losers, in a reconstructed society, will not be determined by the new technology itself but rather by who owns the technology. In terms of ownership, Four Futures calls for a more broad and abstract understanding of property. In this sense, not necessarily ownership or control over tangible things, like the material used to build robots, but ownership over the means to produce and control new technologies. What this means is that buying new technology gives you the rights to use that technology, but how it is used is determined by those who control these new technologies. Four Future’s is a short and accessible read, filled with telling insights into the world of tomorrow through the lens of today. If you use your imagination, none of these four possible futures seem very far away. Whether these changes in capitalism and the process of mass unemployment result in social devastation or social prosperity will not be as a result of an inevitable scientific process. The answer to the question – which future world emerges as a result of intensified automation (a more egalitarian society or one with heightened inequality)? – will dependent on politics, and the class struggle in particular. For Frase it is possible to bring about material prosperity for all, but he says that this “will require a very different kind of economic system”. Four Futures is well worth a read. Where can I buy it? Please send a link if possible.